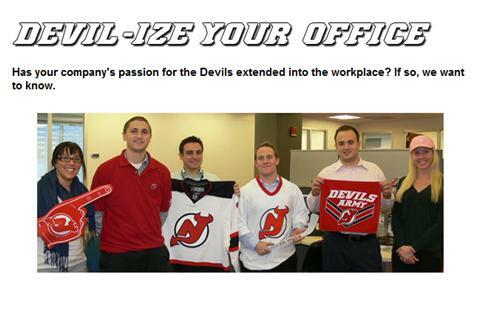 The New Jersey Devils are running a cool "Devil-Ize Your Office" promotion where fans can submit pictures of how they (and their colleagues) show their Devils pride in the office. The office that is the most "Devil-ized" will win a luxury suite to the Devils-Capitals game at the Prudential Center on November 22nd. The program serves as a great way to engage fans as well as the local business community. While the Devils made the submission/registration process is relatively simple, they could have turned the offer into a nice data mining initiative to develop relationships with contacts at several local/regional companies.